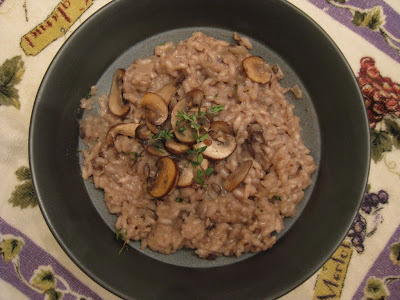 I think some of your success was due to the use of the wide heavy pan which makes risotto cooking so much easier since the pan heats evenly and allows of max absorption of the stock and also the heavy pan stops the rice from sticking to the bottom a superb choice. And it sounds like the mushroom risotto was delicious I made about risotto from 1/2 kg (1.1 lbs) of rice and had plenty of leftovers to make fried rice balls and several other dishes from the cold rice. I really love risotto and all the things you can make from the leftovers. Your stock looks very thick and hearty great results. Bravo on your 2nd DCs challenges hope you have many more happy experiences with us. Cheers from Audax in Sydney Australia. I'm glad you joined the Daring Kitchen, you're going to love it! Your risotto sounds delicious. Andy despises mushrooms so I never use them when I cook, but oh how I long for them sometimes! Congratulations on your first challenge!!! Welcome to the DC! Nice job! Hope you enjoy the Daring Cooks challenges!